CHENNAI. DEC.13: The CCRH Chennai unit medical team headed by Dr.Kolli.Raju, Asst. Director (H) has conducted a Free Homoeopathic Medical Community awareness camp on Mother & Child care on Homoeopathy at Kendriya Vidyalaya School, Central Leather Research Institute Campus Adyar. 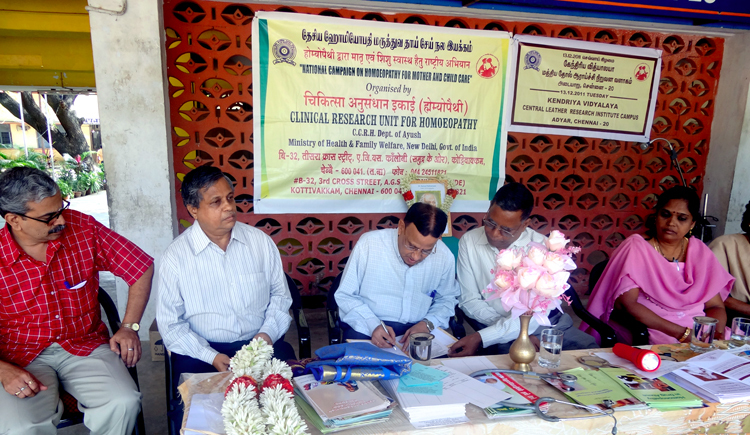 Dr.A.B.Mondal, Director, Central Leather Research Institute, Chief Guest of the occasion inaugurated the camp. Thiru.V.Sreedharan, Principal of Kendriya vidyalya School, CLRI co-ordinated for the camp. Free consultations for the children, women teachers, and public were offered with of free Homoeopathic medicines. Total 187 students, teachers, and other patients were examined and given free homoeopathic medicines.